Tiny beads are changing the way some veterinarians deal with cancer. These beads are effective, cheap and have few side-effects. Are they too good to be true? Around 2008, I came across a new option to complement cancer surgery. Results have been impressive. Until then, chemotherapy and radiation therapy were the two main solutions offered after removal of cancerous tumors, just like in people. Both treatments may cause side-effects, and they can cost thousands of dollars. Chemo beads cost a fraction of any other option. Veterinarians are now able to place tiny cisplatin-impregnated beads around the tumor site. Cisplatin is then slowly released from the beads, which are reabsorbed by the body over 4-6 weeks. Cisplatin is a common chemo drug, normally used with an IV in our canine cancer patients. 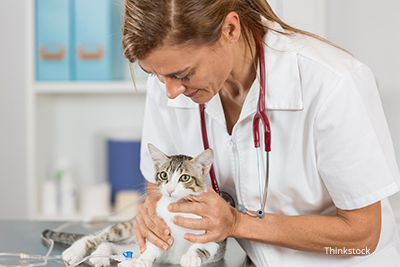 Unfortunately, cisplatin can be deadly in cats, but by including a minuscule dose in the beads, veterinarians are now able to eliminate the former side-effects. The beads measure 3 mm in diameter, or about 1 tenth of an inch. Although cisplatin beads are often effective at preventing or slowing the cancer from coming back, they do not prevent spreading (metastasis), e.g. to the lungs. Fortunately, some of these tumors do not spread readily to begin with. When are the beads placed? The number of beads varies with the size of the tumor. They are typically placed every 1-2 cm. However, to decrease the risks, 6 beads are usually the most used in cats. This means that the tumor can’t be too big, if the patient is to be a good candidate. Side-effects are rare and typically local. They occasionally include swelling, irritation and skin drainage. Although IV cisplatin is deadly in cats, I have not observed or heard of general side-effects after bead placement. Ironically, chemo drugs can cause cancer. Therefore, the pet parent should not touch any drainage with bare hands. Should the incision drain, it is important to wear disposable, single-use gloves to clean the fluid. Licking the incision must be prevented. Cats who receive chemo beads should wear an E collar 24/7, if it was recommended, and should be separated from other pets. Cisplatin beads have not been approved by the Food and Drug Administration (FDA) for use in cats. However, there are almost no FDA chemotherapy drugs that are approved for pets! Most often, what veterinarians must use are actual human drugs. Which cancers might chemo beads be used for? So what’s my take? The beads are keeping their promise: they are effective, they are cheaper than all other options, and they have minimal to no side-effects. Remarkably, we can use beads in cats despite the fact that IV cisplatin is deadly. From personal experience, the beads have been remarkably well tolerated. Other surgeons who have used the cisplatin beads have been equally impressed. Still, it is a relatively new treatment that few surgeons have heard about. Hopefully, as more colleagues learn about them, more cats will benefit from them. Would You Like a Cat with That Coffee?